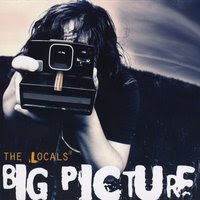 Imagine a rawer, moodier Gwen Stefani at the helm of straight-up, stripped down alternative pop, and you'll get a pretty good idea of what Chicago's The Locals deliver on "Big Picture," their fourth and most recent LP. While the band has been around since 1996, this release marks a change in direction, finding front woman Yvonne Doll and the rest of the band moving from a singer-songwriter sound into a more driving, guitar-heavy territory. There are obvious 90s rock influences here, at times bringing to mind acts such as Juliana Hatfield, The Breeders and Joydrop, but The Locals exude enough confidence throughout to own the material. Doll's vocals come across as heartfelt and convincing, while the band is tight and the production is strong. The CD's most notable moments come when the band strives for a poppier, hook-heavy sound, as evidenced on catchy album opener "Tidal Wave" and the sprightly "Sign of Things to Come." Quieter, more subtle tracks, such as the title track, help round out the disc's sound, but are more likely to take a few spins to click. Fans of straightforward, 90s-esque alternative and female fronted-rock should find much to like about The Locals and their latest project. Check out the band live on January 8 at Martyrs' and February 21 at Subterranean. Support the Chicago music scene by checking out Breakers Broken! They put on a fantastic live show, and they’ve got one at the Logan Square Auditorium on December 20th!